Q: Saudi Arabia Crown Prince recently visited Pakistan. During his visit, Saudi Arabia and Pakistan signed investment cooperation agreements amounting to USD 20 billion. Saudi Arabia will also set up an oil refinery and petrochemical complex in Gwadar where China is already undertaking a lot of mega projects. What is China's comment on these investments? A: We have noted relevant reports and are glad to see Pakistan develop friendly exchanges and cooperation with other countries, including Saudi Arabia. The China-Pakistan Economic Corridor is a pioneering project of the Belt and Road Initiative and has been following the principle of wide consultation, joint contribution and shared benefits as well as openness and transparency. Last year, during State Councilor and Foreign Minister Wang Yi's visit to Pakistan, the two sides agreed to welcome third parties to join the CPEC projects so that the CPEC will not only benefit the people of China and Pakistan, but also help the region enhance economic cooperation and connectivity and realize common development. China stands ready to engage in third-party cooperation with Pakistan on the basis of consensus. 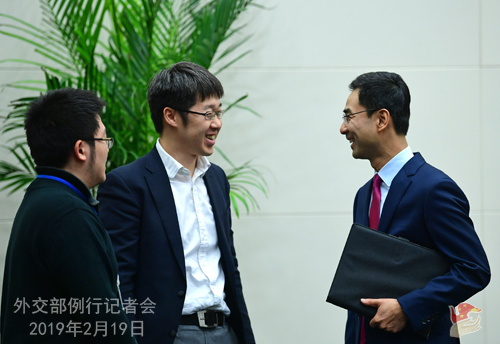 Q: Today there is a high-level Iranian delegation visiting China led by the Speaker of the Iranian Parliament. Iran's foreign minister is also in the delegation. Could you give me any information you can share about the visit? And, over the next six months or a year further, to what extent will Chinese oil imports from Iran be determined by US demands and waivers? Will China reduce oil imports from Iran as America desires? A: At the invitation of Chairman Li Zhanshu of the Standing Committee of the National People's Congress, Iran's Parliament Speaker Ali Larijani is paying a visit to China as head of the delegation from February 18 to 20. To my knowledge, Chairman Li Zhanshu will meet with Speaker Larijani this afternoon. More information will be released in a timely manner. Iran's Foreign Minister Mohammad Javad Zarif, accompanying Speaker Larijani during this visit, met with State Councilor and Foreign Minister Wang Yi today at noon. The Chinese side will release relevant information in a timely manner. You are welcome to follow up on that. 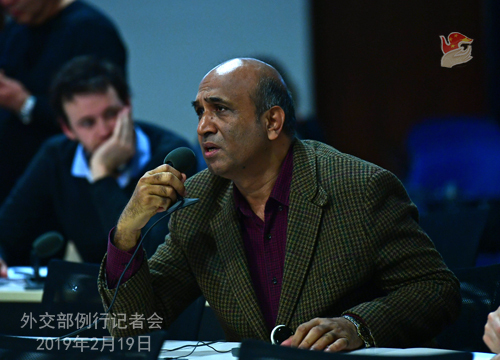 As for China's energy cooperation with Iran and its oil imports from Iran, what I can tell you is that the normal cooperation between our two countries under the framework of international law is justified and legitimate, which should be respected and upheld. Regarding the US attitude on other countries' cooperation with Iran, I think China's position is clear: we have always opposed unilateral sanctions and "long-arm jurisdiction". Q: According to media reports, New Zealand Prime Minister Jacinda Ardern said at a press conference that China is a very important and highly valued partner for New Zealand. The relationship between the two sides is robust and mature. New Zealand and China have different views on some issues. However, the two sides can manage these differences together in a mutually respectful way. What is your comment? A: I commented on China-New Zealand relations last Friday. Back then, I said that the sound and steady development of China-New Zealand relations serves the common interests of the two countries and peoples. China stands ready to work with New Zealand to advance bilateral relations on the basis of mutual respect, equality and mutual benefit. Today, I would like to stress again that when it comes to bilateral relations with China, New Zealand has long been occupying a leading position in developed countries as it set many records in bilateral cooperation. Under the new circumstances, China-New Zealand relations are facing new opportunities for development. Following the principle of mutual respect, equality and mutual benefit, the two sides need to enhance mutual trust and cooperation, rise above disturbances and work for the steady and sound growth of China-New Zealand relations. Q: The Washington Post recently reported that China has a military presence in Tajikistan. Could you comment on that? Q: According to reports, another round of China-US trade consultation will begin on February 21 in Washington D. C. Now with the deadline of March 1 drawing near, some people believe this round of consultation becomes even more important in avoiding the deterioration of a trade war. What is China's comment on this? A: I believe you have seen the information released by the Ministry of Commerce. At the invitation of the US side, Liu He, special envoy of President Xi Jinping, member of the Political Bureau of the CPC Central Committee, Vice Premier of the State Council and chief of the Chinese side of the China-US comprehensive economic dialogue, will pay a visit to Washington, D. C. and hold the seventh round of China-US high-level economic and trade consultation with Trade Representative Robert Lighthizer and Secretary of the Treasury Steven Mnuchin of the US side from February 21 to 22. We hope China and the US can jointly implement the important consensus reached by the two Presidents during their summit in Argentina, pick up speed and work together for a mutually acceptable agreement that produces win-win results, which I believe will serve the interests of both our countries and meet the common aspiration of the international community. 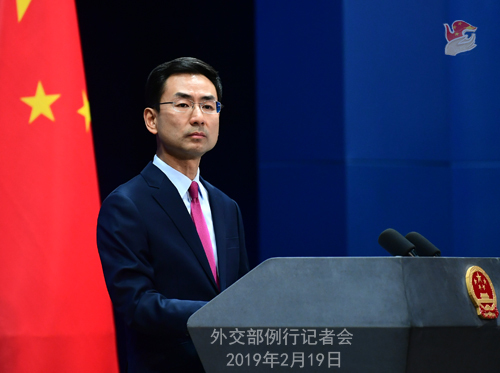 Q: We noted that recently certain media agencies, citing the remarks of the security institutions of some Western countries, have pointed out that the US and its allies have yet to provide real evidence that Huawei has cooperated with the Chinese government in cyber theft. But on the other hand, they believe that due to concerns over the stipulation of Article 7 of the National Intelligence Law, Western countries should take restrictive measures on Huawei technologies and equipment to guard against possible risks. What's your comment on this? The relevant media admitted in their reports that the US and other countries have never been able to produce evidence of cyber theft by Huawei and other Chinese businesses, and we approve of such an objective attitude in reporting. In response to those doubts over China's National Intelligence Law, I already elaborated on China's position yesterday so I am not going into details here, and you may check online for yourselves. I only want to stress one point: Article 7 of the National Intelligence Law does stipulate that "an organization or citizen shall support, assist in and cooperate in national intelligence work in accordance with the law and keep confidential the national intelligence work that it or he knows ". But the subsequent Article 8 also clearly provides that "national intelligence work shall be conducted in accordance with the law, respect and safeguard human rights, and protect the legal rights and interests of individuals and organizations". I'm wondering whether those who criticize this law and make an issue out of its Article 7 have ever had a thorough and careful reading of the provisions? I hope that they will view and understand this law in a comprehensive and accurate manner instead of making one-sided and out-of-context interpretation. At the same time, other Chinese laws also have stipulations on safeguarding the legal rights and interests of citizens and organizations including data security and privacy. These stipulations all apply to national intelligence work. We hope that the relevant parties will not deliberately ignore or turn a deaf ear to them, but take off the tinted-glasses, abandon their presumption of guilt and view the normal business activities of Chinese enterprises in an objective and unbiased way. 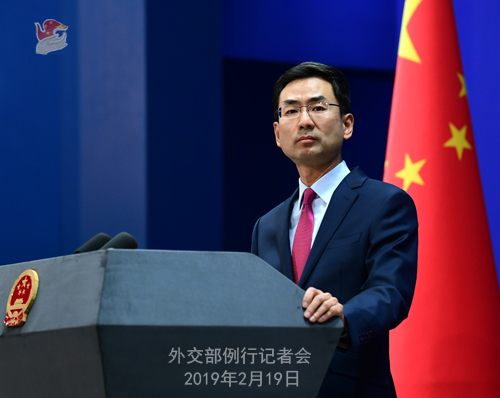 Again, we call on governments of relevant countries to truly abide by the market principles of fair competition and provide a fair, just and non-discriminatory environment for the legal and legitimate operation of Chinese businesses. Q: Pakistan has always stressed the importance of dialogue for resolution of all outstanding issues with India, including the Kashmir issue. Prime Minister Imran Khan also said that he wants to have good relations with India and restart talks. However, after the attack on the India-controlled Kashmir region, the tension is very high between the two countries as India blames Pakistan for the attack and Pakistan has rejected the accusation. As a close neighbor of both India and Pakistan, how will China play its role to reduce the escalation between India and Pakistan? A: Pakistan and India are both important countries in South Asia. A stable Pakistan-India relationship is crucial to regional peace, stability and development. At present, the situation in South Asia is generally stable, which is hard-won and should be cherished and upheld by relevant parties. China hopes that Pakistan and India can exercise restraint, engage in dialogues and realize an early "soft landing" of this issue. Q: Yesterday the CPC Central Committee and the State Council jointly released the outline development plan for the Guangdong-Hong Kong-Macao Greater Bay Area. How will China cooperate with other countries to develop the greater bay area? A: China pursues an open strategy that is mutually beneficial in nature. Our doors are open to the world. In implementing the outline development plan for the Guangdong-Hong Kong-Macao Greater Bay Area, foreign companies are welcome to participate and share opportunities brought by China's development.